Ezra Tilaye decided to rebrand, rename and reformat his restaurant Crēme located on one of the America’s historical byways, Charles Street situated in Baltimore’s Mt. Vernon neighborhood. This section of Charles Street, in its day, was like New York’s Fifth Avenue. It was filled with boutiques and artisan shops like Potthast Brothers and Ware & Company, both furniture manufacturers. It was the history of the building that was Tilaye’s muse, to refresh the restaurant with an earlier industrial era look. The location at 518 N. Charles Street was formerly the infamous Louie’s Bookstore & Café, Ixia Restaurant and then there was Tilaye’s Crēme Restaurant and Bar - now it is Ware House 518 Restaurant and Bar. 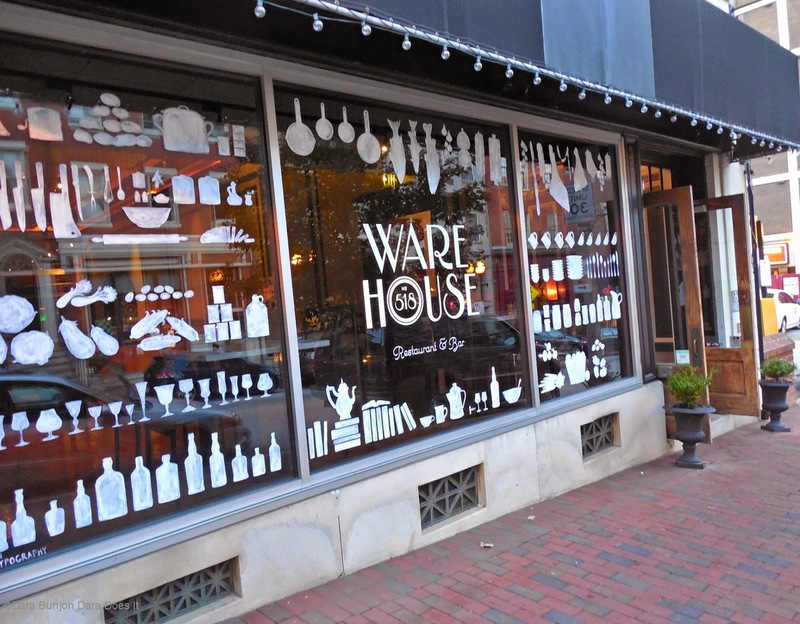 The entire front façade is hand painted by artist Lyla Shlone with eye catching white images of food, drink, knives, and books encircling the restaurant logo which was designed by Posttypography.